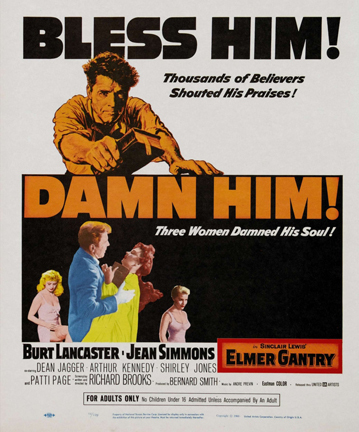 Best Video Performance Space will screen the “Elmer Gantry” on Tuesday, Oct. 11. The program starts at 7 PM and the cover is $7. Christopher Sharrett, a Professor of Film Studies at Seton Hall University will introduce and discuss the film. Christopher Sharrett is Professor of Film Studies at Seton Hall University. He has published several books on film, including Mythologies of Violence in Postmodern Media, and The Rifleman. He is a Contributing Writer for Cineaste and Film International. He is on the editorial board of Quarterly Review of Film and Video. He has lived in Hamden for 28 years, and is a Best Video loyalist! Richard Brooks’ 1960 adaptation of Sinclair Lewis’s novel about Evangelical Christianity and American thought is a topic even more important today than at the film’s release. The film stars Burt Lancaster, Jean Simmons, Arthur Kennedy, and Shirley Jones. Sinclair Lewis’ “Elmer Gantry,” which shocked, amused, confounded, but rarely bored readers back in 1927, has been lifted from the pages of the justifiably controversial novel and impressively transformed into an exciting film. The briskly paced drama of a religious opportunist, his colleagues and his times utilizes the tools of the motion picture in expert fashion. According to Weiler, director Brooks brought the book vividly to life in the film, led by a brilliant performance by Burt Lancaster. Come for the movie and feel free to stay for the discussion of the movie’s relevance to the current day—more than 50 years after the film opened and almost 90 years since the book was published. The latest film series in collaboration with Temple Beth Sholom continues Monday, Mar. 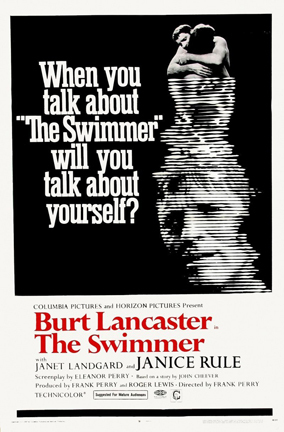 2, at 7 PM with a screening of the 1968 film “The Swimmer,” starring Burt Lancaster and based on a short story by John Cheever. “Found Horizons: Changes and Choices in Mid-Life” features powerful films in which the protagonists face stark mid-life choices. As has been our practice, each screening begins with a short, context-setting introduction and is followed by an optional discussion. Each screening begins at 7 PM. The cost for each movie is $5 and reservations are encouraged. Reservations are particularly encouraged for this movie—we already have a substantial list of people planning to attend. The series is co-sponsored by Temple Beth Sholom Adult Education. In “The Swimmer,” a unique movie filmed in New Canaan, CT, a charismatic and mysterious man (played by Burt Lancaster), after a summer away, decides to swim in a succession of his neighbor’s pools that lead to his home, a stunt that winds up telling his life story. Engaging poolside encounters with an interesting cast of characters (including Joan Rivers, Marge Champion and Cornelius Otis Skinner) lead to a shattering revelation in this film that, once seen, is never forgotten. In this unique movie filmed in New Canaan, CT, a charismatic and mysterious man (played by Burt Lancaster), after a summer away, decides to swim in a succession of his neighbor’s pools that lead to his home, a stunt that winds up telling his life story. Engaging poolside encounters with an interesting cast of characters (including Joan Rivers, Marge Champion and Cornelius Otis Skinner) lead to a shattering revelation in this film that, once seen, is never forgotten. “Gran Torino” (2008)In this multiple award winning film and old school parable, Clint Eastwood (who also directed the film) plays a disgruntled Korean veteran living alone in a Vietnamese neighborhood, determined to fight his own demons and prejudices with grit and resolve. DIRTY HARRY grows up. Can a Boston spinster without self-esteem and completely dominated by her wealthy mother blossom under therapy and find impossible romance? One of the most romantic movies – and perhaps most affecting Bette Davis film – ever made. In this very contemporary film starring George Clooney and Vera Farmiga, Clooney enjoys a lucrative virtual life flying around the country firing people on behalf of their corporations, until he finds this perfect life threatened by a new hire and a frequent-traveler woman of his dreams. “A Late Quartet” one of Best Video owner Hank Paper’s favorite films of the last couple of years. Featuring rapturous music and bravura acting (including Philip Seymour Hoffman, Catherine Keener, and Christopher Walken in a completely involving “straight” role), this dramatic film portrays a classical string quartet, approaching its 25th anniversary recital, that suddenly finds itself struggling to stay together in the face of long suppressed emotions, competing egos and uncontrollable lust. It’s what movies are all about! Best Video Performance Space will screen the John Frankenheimer movie “Seven Days in May” on Thursday, Nov. 20. The program starts at 7 PM and the cover is $5. Christopher Sharrett, a Professor of Film Studies at Seton Hall University will introduce and discuss the film. “Seven Days In May” is a historic, perhaps prophetic film. John Frankenheimer adapted the popular novel by Fletcher Knebel and John W. Bailey at the suggestion of his friend, President John F. Kennedy, who felt that after the failed Bay of Pigs operation to invade Cuba, and the subsequent Cuban Missile Crisis,that a coup against the government was a possibility. 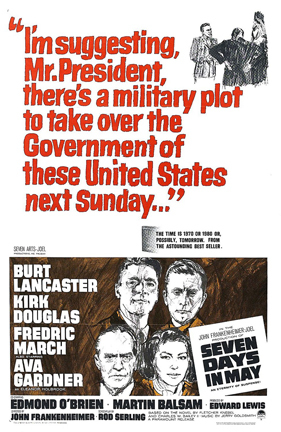 In Frankenheimer’s film, Frederic March plays a president targeted for removal from office by a Pentagon clique because he is seen as “soft on Communism,” a description applied to Kennedy in right-wing circles at the height of the Cold War. Chillingly, a month before his assassination, columnist Arthur Krock wrote a piece for the New York Times called “The Intra-Administration War”, stating outright that a coup by the CIA was a real possibility. • Tuesday, Nov. 11. 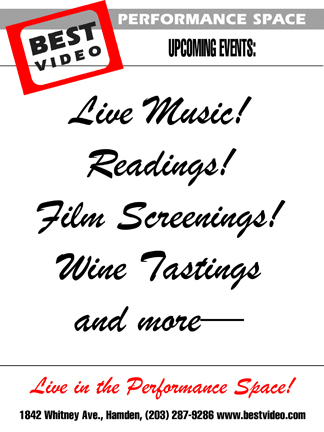 TRIBUTE TO FRANK SINATRA: FRANZ DOUSKEY & RICH MORAN, JR.
Best Video Performance Space will screen the 1983 comedy/drama “Local Hero” on Monday, June 2. The movie starts at 7 PM and admission is $5. We will screen the film on our 120-inch projection screen. 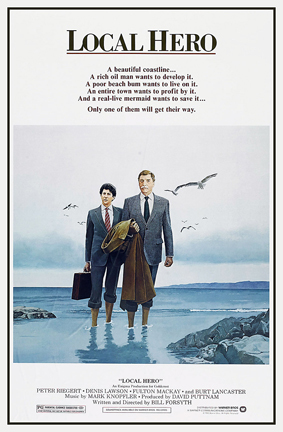 “Local Hero,” which stars Burt Lancaster and Peter Riegert, was written and directed by Bill Forsyth. Riegert is the emissary of a Texan oilman, played by Lancaster, sent to negotiate oil drilling rights with a Scottish fishing town. But will Riegert go native? Genuine fairy tales are rare; so is film-making that is thoroughly original in an unobtrusive way. Bill Forsyth’s quirky disarming ”Local Hero” is both, and it’s also proof that Mr. Forsyth’s other feature film released here, ”Gregory’s Girl,” was more than a happy accident. The Glasgow-born Mr. Forsyth has put Scottish comedy on the map, for whatever that’s worth. He has also developed a dryly whimsical style, very close to a deadpan at times, that allows the strangest events or personages to glide by almost unnoticed. ”Local Hero” contains a mermaid, an enchanted village and a possibly magical rabbit. No undue fuss is made about any one of them. “Local Hero” is being presented through the support of Best Video member John McNamara, a strong supporter of the Performance Space programming.